According to the DVD Episode Guide: After Starsky and Hutch arrest a deaf-mute for stealing candy, he is rescued by the 'priest' who runs the ex-con halfway house where he lives. All the clues in a rash of burglaries lead back to the candy-stealing culprit, but it's the 'priest' who might be less than holy. Now maybe it's EH's unhappy relationship with food this past month, or the fact that Rebel's been accused of being a Food Nazi in her household, but we believe this episode is all about using food as a weapon. As the episode opens, Starsky and Hutch have arrested a shuffling, gormless, er... we mean sensitively portrayed deaf-mute individual for shoplifting $42.30 worth of candy from Papa Giovanno’s Candy Store. Papa Giovanno must sell some quality and/or overpriced chocolate, because that does not look like 200 candy bars spilling out over Hutch’s desk. We speculated that Starsky might have stashed the rest in the trunk of the Torino, but he appears far too hungry. 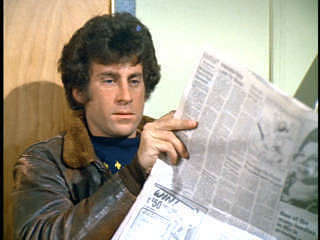 Cruelly, Hutch denies him a snack and Starsky retreats behind his newspaper. Hutch tries to interview Larry, the candy bar thief, but he’s having a rough go of it as Larry blubbers, Starsky sulks, and Dobey makes disapproving noises. Luckily, before Hutch is forced to reinvent sign language, Father Jonathan Ignatius and R.C. Turner walk into the squad room. 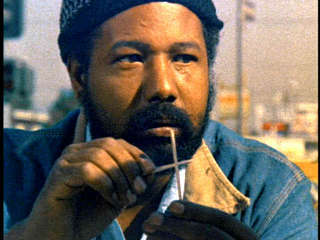 Father Ignatius runs a half-way house for ex-cons, while R.C. (not the Cola) is Larry’s best friend. A prison guard beat R.C. until he lost his speech and hearing. So now he doesn’t trust cops (but prison guards he’s a-ok with)! 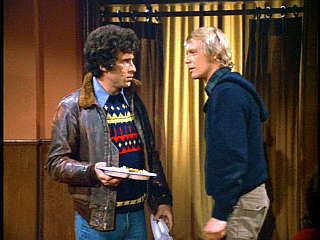 Larry is sprung, and Hutch asks him to take all the candy away with him to Starsky’s obvious dismay. Sweet and trusting Larry, who is evidently burdened with far more than just hearing impairment, insists on giving Hutch a candy bar. Actually, the “sweet and trusting” part is pounded into us several times during this episode, but Larry comes across to us as creepy and manipulative. You just know he’s learned how to turn on the tears to get away with... shoplifting. Not murder. Yet! Meanly, Hutch does not share his candy with Starsky, but that might be because Starsky is now laughing at him for having just been told off by a priest and hugged by a very enthusiastic deaf-mute. Apparently, the social lesson here is that Hutch should have paid the candy store owner himself and let Larry go to steal another day. Old age has not been kind to Super Villain, Venom. Actually, it’s not so. 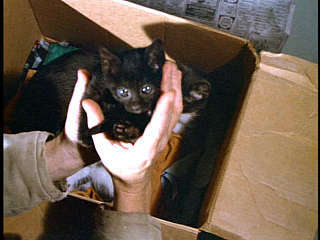 Larry introduces our heroes to his stray (or purloined) kittens. Eventually, everyone gets together upstairs, where we discover that we’re in Father Ignatius’ half-way house, AKA The Dismas Center. You know, Dismas, the holiday celebrated in January, after Christmas. While Starsky browses the Father’s bookshelves and unsuccessfully tries to steal cookies from the tea-cart lady, Hutch asks for a complete list of the current residents. It appears to be against the under-paid and starving seventies TV writer’s code to allow viewers to remain in suspense. 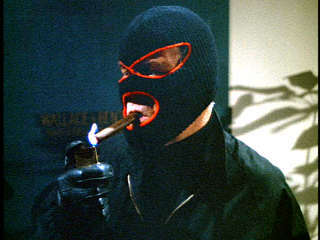 As soon as Father Ignatius is alone, he lights up an obviously stolen cigar. His lackey, a boy named Kim, confirms for us that yes, Father Ignatius is the jewel thief and a cop-killer. Don’t ask us which cop, this is Bay City. Another day, another dead cop, to quote Hutch. Instead, a convoluted bit of exposition follows, and the upshot is that their bomb expert Bessinger must die and someone else must be framed for the robberies. Overly complicated plots are the downfall of the wicked every time. 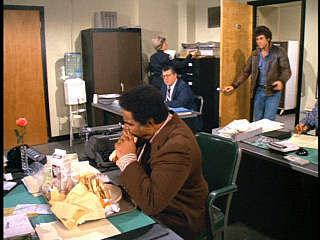 The next day, at the precinct, it looks like Starsky may finally be getting a real meal! He needs one, too. Careful analysis of his conversation with Hutch reveals that after leaving the Dismas Center, they both retired to Hutch’s apartment where Hutch fed Starsky “a meal” he couldn’t eat. Perhaps Starsky doesn’t swallow, or maybe fasting changed Hutch’s PH balance? On top of that, Starsky missed breakfast! Was Hutch too busy domestically disciplining him to feed him? Starsky and Hutch have both been without substantial nutrition for almost twenty-four hours now. Starsky is almost orgasmic over his tray of potato chips, submarine sandwiches and chocolate milk. Clearly unconcerned about any jealousy on Hutch’s part, he announces that if his lunch could sing, dance and whistle Dixie, he’d marry her. Oh well, Hutch, two out of three ain’t bad. But before Starsky can commit culinary infidelity, Dobey interrupts with Bessinger’s location. 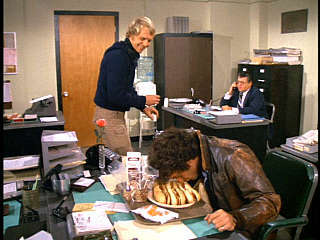 Starsky tries to take his lunch with him, but Dobey reminds him that it’s against regulations to eat on duty. It’s the first time we’ve heard of this rule, and Starsky seems equally shocked. Dobey then steals his subordinate’s lunch while our low blood sugar boys head for the bar where Bessinger works. They stake out the shuffleboard game, and Hutch has a beer. Evidently it’s against regulations to eat on duty, but drinking on an empty stomach on duty is okey-dokey! Starsky is clearly getting desperate for nutrition. He quickly ducks out to pick up an order of Chinese food. Of course, as soon as he’s gone, Bessinger gets the Dramatic Phone Call summoning him to his doom. Starsky returns just in time to collide with Bessinger and ends up wearing his dinner instead of eating it. The next time they see Bessinger, he’s lying dead on the floor of the Metropolitan Jewelry Mart, and there’s a candy bar wrapper on his corpse. Oh, no! Father Ignatius has framed Larry for the murder! Starsky, that sign doesn't mean "arrest", it's a cross-your-heart bra! R.C. reminds us that nobody expects the Spanish Inquisition! Unaware of the crotch-cam, Starsky attempts to discreetly adjust himself. Start talking, or Hutch will do his Enhanced Interrogation Lap Dance! Do you think Pat O’Brien will ever forgive us? Of course they will. This isn’t 24, after all! 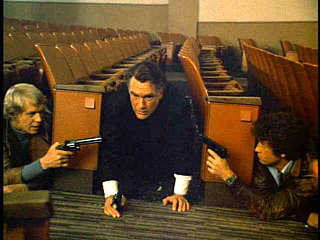 Hutch runs in the front of the theater, while Starsky attempts to enter at the rear. Getting into the spirit of this food fight review, Larry throws popcorn at Ignatius and skedaddles. Shots are fired willy nilly and even the walls escape unharmed. 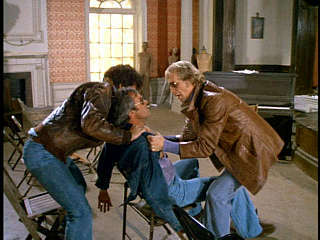 Ignatius throws open the back door, slamming it into the top of Starsky’s skull and knocking him head over heels. It’s fun to watch in slow-mo. Over and over again. Not that we enjoy watching Starsky get hurt or anything... No! Hutch pops out another door, more shots are fired, and Ignatius ducks back inside. Starsky insists he’s all right, and staggers after them holding his head. He almost gets taken down by a ferocious set of stage curtains, but managed to fight his way through to the theater. A game of cat-and-mouse follows on the sticky floors among the popcorn kernels. Starsky joins the food fight and throws more popcorn, though that might just be to cover for the fact that he’s frantically stuffing as much as he can into his mouth. Hutch rolls, because rolling always helps. In the end, Ignatius is nabbed and justice is restored to the world. Though, the real Father Ignatius is still dead and probably buried under the Dismas Center somewhere, but no one cares about him. Or the dead cop that was never identified. Or the dead security guard who’s never actually mentioned. Bay City really is a tough town. Bay City Sign Language for, "Maybe you've seen me on TV?" 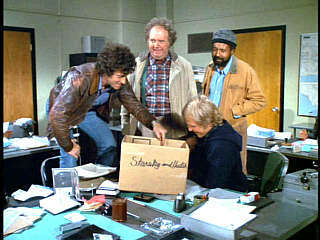 Starsky searches the personals for single chefs who moonlight as cops. Come to think of it, I never seen a thin hoppapitamus, either. The boys pull into the parking lot of the Chubby Chicken Coffee Shop. It’s decorated for Christmas! But wait, it’s January in Bay City, isn’t it? Starsky orders two hamburgers, a double order of French fries, one of the Chicken’s super duper chocolate malts, a cup of coffee, and a side of sexual harassment. Hutch, it turns out, is embarking on a forty-eight hour fast to maintain his “already fantastic physical condition” just like the fad-diet obsessed lions do in the savannah. Unfortunately, as the waitress arrives with Starsky’s tray of food, the radio crackles and our lean, mean, lion-like duo are summoned off to answer a 2-11 in progress at Wallace & Benton, Wholesale Jewelers. Starsky protests the loss of his dinner to no avail, Hutch is the top this week. A cigar smoking jewel thief murders a criminally overconfident security guard. He bolts with his carpet bag of cubic zirconium, just as Starsky and Hutch pull up in front of the building. Starsky rips his jeans, Hutch steps on Starsky’s “bonnet” and a thrilling chase ensues, complete with a soundtrack inspired by Jaws. A shadowy figure darts into a building, and they follow only to find themselves in a basement where they confront... Larry! Oh, say it’s not so! Lower yer guns, coppers! This kitten is loaded! 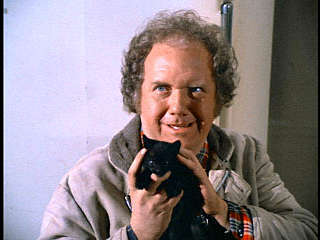 Hutch has good reason to be jealous of Starsky's relationship with food. This is WAY worse than when Starsky walked in on Dobey and Hutch! Starsky contemplates serving up an order of Peking Hutch. They can’t hear, so you shouldn’t have any trouble sneaking up on them. Starsky and Hutch are becoming a bit suspicious of Father Ignatius, but hunger is clouding their minds. They head over to the print shop where Larry lives with R.C., which makes us suspect it’s not just kittens that Larry cuddles at night. Meanwhile Father Ignatius heads down to the basement where he’s secretly stashed Larry, and asks for the print shop’s gun. Every commercial establishment in Bay City, from Italian restaurants to massage parlors has a gun. Father Ignatius then manipulates poor, kitten-loving (but not in that way!) Larry into running amuck on the streets, slamming into pedestrians, running over girls in funky rainbow sweaters, and generally acting exactly like a crazed killer on the lam. And all in order to protect R.C. because apparently The Man can make Larry “say anything”. Which must be quite a trick considering Larry is mute. 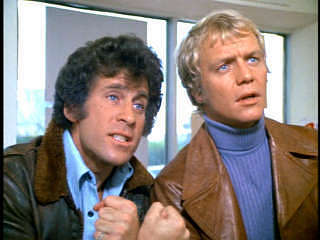 Now Starsky and Hutch are racing against time to win RC’s trust and find Larry before some street cop shoots him dead. Dobey helps by putting out an “armed and dangerous” APB out on Larry. A seventies-style montage follows with some bleak views of the smoggy streets of Bay City, including a city bus which appears to have taken a wrong turn from Los Angeles. Or maybe it’s part of the same exchange program which has Long Beach police cruisers parked in front of Parker Center. We spend a few minutes at the playground sighing wistfully for the good old days when you could give yourself broken limbs, concussions and tetanus swinging off rusty monkey bars. At the seedy pet shop, R.C. has run out of ideas and Starsky has run out gas. We suspect R.C. is leading our intrepid duo on a wild goose chase, as he’s conveniently neglected to mention either the missing gun or the movie theater where Larry is currently burying his sorrows in a wild west movie marathon. Starsky’s attempts to order food for himself are foiled again as it finally occurs to our heroes that Father Ignatius might be a suspect. 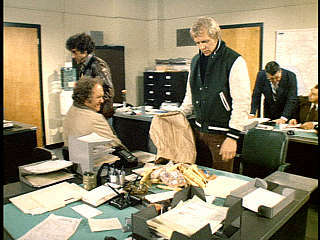 Starsky ends up throwing money at R.C. as he and Hutch race off to the Dismas Center. Not only has Starsky not been fed in longer than bears thinking about, but he’s out of pocket a fair bit as well. When this case is over, Hutch had better have something more nutritious to offer him than whatever he had on the menu the night before. We’re not saying it’s his own man-juices, but we’re most suspicious. Especially considering that Starsky is now so faint with hunger he feels he needs permission from Hutch to eat. On the way to the Dismas Center, Dobey redeems himself by discovering that the real Father Ignatius is seventy-five. 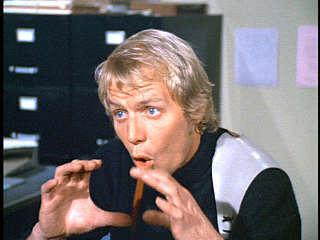 Starsky and Hutch nab Kim, who tells them that the fake Ignatius is heading over to the theater to kill Larry. Will our heroes get there in time? Silly Starsky, rolling only helps if you're Hutch or Captain Kirk! In the Academy, Starsky & Hutch placed first in Synchronized Shooting. Starsky notices there's still price tags attached to the kittens. Obviously one of Puss-in-Boots' love children! 1. Never mind that there’s obviously only one kitten in the box during the tag, when we first saw the kittens there was no tabby kitten anywhere! Where did it come from? 2. How likely is it that Larry’s finally ended his life of crime? Is he still out there stealing candy? Or did an irate shopkeeper finally gun him down? 3. Why didn’t Hutch want Starsky to eat? Was it an underhanded plot to get his partner to slim down so that it’s easier to get him out of his jeans? Or is he just tired of having all his coat hangers bent out of shape whenever Starsky stays overnight?